Nearly half of IT budgets will be dedicated to IoT development and implementation by 2020 as IoT services adoption continues to grow. IT budgets are in for a significant transformation as Internet of Things (IoT) services become a top priority for businesses. By 2020, IoT should indeed account for 44 percent of IT budgets on average among U.S. businesses, according to new research conducted by Machina Research and commissioned by the Telecommunications Industry Association (TIA), InterDigital and Telit. 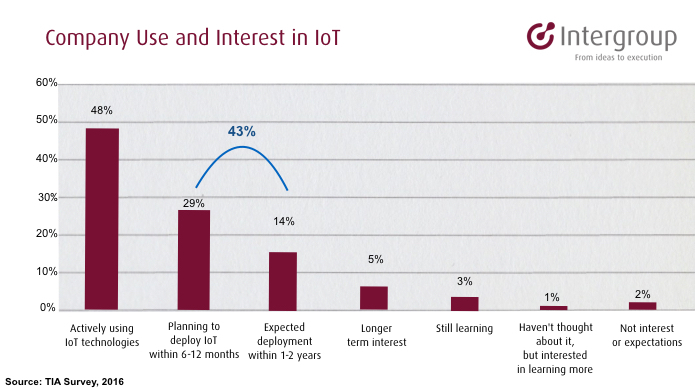 The research, conducted among 200 U.S. businesses, found that almost half of decision-makers (48 percent) are already actively using IoT technologies today, while another 43 percent are looking at deploying IoT solutions within the next two years.